Excited to kick off my annual Back to School series with a review & giveaway of our favorite brand of lunch bags. PACKiT lunch bags are freezable…the most convenient bags for busy moms. No hassle with squeezing ice packs into your kids lunch bags along with everything else. These bags keep my kids lunch cold till they go to lunch between 11am and 12pm. Not to mention they are stylish too…a wide variety of styles and designs and the brand isn’t limited to use for kids. I even use the picnic tote on a daily for our afterschool/dance snacks bag. Hope you enjoy this video and giveaway! Stay tuned for more BTS videos to come! GOOD LUCK! Enter the $100 PACKiT giveaway below through rafflecopter OR click HERE. 3 Responses to "PACKiT Freezable Lunch Bags | Review & GIVEAWAY! 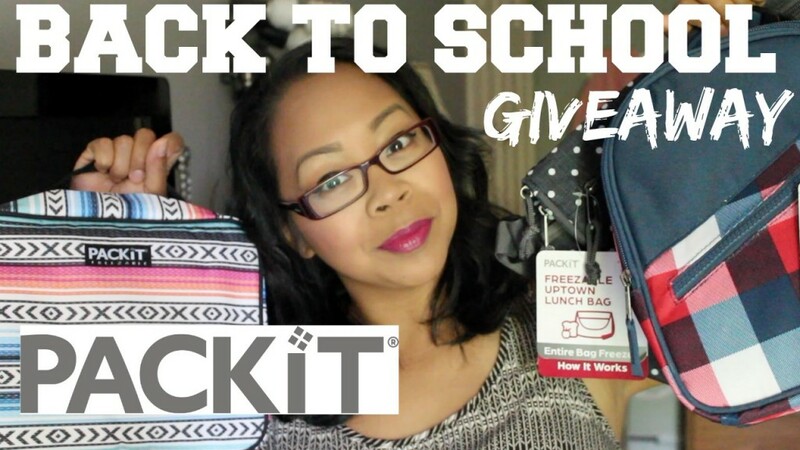 #BackToSchoolGiveaway"
Love watching you on YouTube and hearing your tips. As a busy mom of three myself, I always look for ways to make our lives more organized and fun. Love the idea of Packit! This would be wonderful for my girls. I have a 2nd and Kindergartner and will pack everyday due to food allergies. You have wonderful videos! Love that you share mommy tips! Have a great rest of summer and a wonderful school year! Would absolutely love to win, I’ve been wanting to try for my kids lunch.